Today an official opening of two exhibitions has taken place in the Tuvan Museum of the Study of Local Lore, named after Aldan Maadyr (60 Hercules). 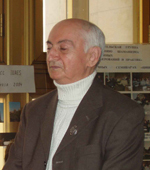 Both exhibitions are devoted to the 80th anniversary of world-famous researcher Sevyan Vanshtein. One is made up of the museum artifacts collected by Vainshtein in the course of his expedition to Todzha district (Tuva's Northeast) half a century ago. The second one is Todzha in pictures taken 40 years after by Brian Donahoe, speaker of Tuvan, whose thesis at Indiana University deals with indigenous natural resource management among the nomadic reindeer herders of northeastern Tuva. Novosibirskstat has made public the average monthly salaries in Siberian regions. On the top is Krasnoyarsk territory with 11496 rubles ($456). Within the region there are its own leaders; Taimyr (20947=$776) and Evenkia (16298=$604). These parts of Krasnoyarsk territory are rich in hydrocarbons. Kyzyl hosts a large industrial fair of Siberian goods and services. The 3d Interregional TyvaExpo has opened in the Tuvan Drama Theatre. Forty-five manufacturers from Yarolsavl, Novosibirsk, Tomsk, Omsk, Krasnoyarsk, Yekateribourg, Abakan, Minusinsk are set up in a theatre foyer offering visitors a wide range of goods, from Indian textile and haberdashery to office furnitures and printing equipment. Albert Kuvezin is the leader of Tuvan group Yat-Kha. The Central Asian band has taken Tuvan folk music to uncharted territories, crossing musical boundaries. 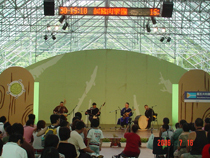 Kuvezin is also responsible for popularizing Tuvan throat singing worldwide through several of his projects. Yat-Kha has a new recording out, Re-Covers, which combines rock music with Tuvan roots. World Music Central interviewed Kuvezin in Kyzyl (capital of the Tuva Republic) through an Internet Cafe. Delegation of Management of Kamby lama of Tuva arrived at Ulan Bator to meet with Dalai-Lama. Spiritual leader of Buddhists paid special attention to this delegation before heading to the historical temple of Ganden Tenchenling monastery where he gave instructions concerning internal regulations for Buddhist monasteries in both Mongolia and Russia, Center of Tibetan culture and information reported. Tuva is invited to send its national beauty contest winner to the World Miss Asia Contest which is to take place in Mongolia, September 18-19. 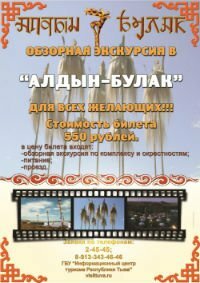 But the 14-year-old winner of the recently held Tuvan 'Dangyna' contest Orlana Saryglar does not fit into the set international standards, Kima Dongak, director of the Tuvan contest, reported to Tuva-Online. A 170-sm tall girl - quite high amidst Tuvans - is not high enough to compete with other Asian beauties, Kima regrets. "We have to hold a new casting inviting tall Tuvan girls to take part in it. But they are usually unwilling. It's a hard job to be a model. And they do not want to work hard preferring to have fun with their friends". His Holiness Dalai Lama XIY is expected today in Mongolia for an eight day visit. For buddhists coming from the three Russian republics -- Tyva, Kalmykia, Buryatia -- it is a unique opportunity to meet the head of the buddhist hierarchy for the Dalai Lama, who has been refused a Russian visa several times for the last few years. The Tuvan delegation headed by Kamby-lama of Tyva Djampel Lodoi went to Ulaan-Baatyr to attend His Holiness' lectures. Projects, including some connected to Kremlin-friendly oligarchs, have made a shortlist to get money for infrastructure projects from the state investment fund. The Economic Development and Trade Ministry, which oversees the fund, confirmed that an interministerial committee had shortlisted 12 of 46 bids to receive a total of 70 billion rubles ($2.6 billion) available this year. Few people in Taiwan will have heard of the Tuva Republic or be aware that it is home to one the world's most unusual cultural experiences. Tuva is in south-central Siberia and borders northwestern Mongolia. It is an agricultural region with its people being mainly occupied with sheep herding and raising cattle. It has a diverse climate with temperatures ranging from -50 degrees Celsius to 38 above. Over the centuries the Tuvan people have been under the rule of Chinese emperors, Mongol warlords, and Russian czars. The Tuvan people have now achieved a state of autonomy within the Russian federation. A criminal case was incited on the fact of a teenager's kidnapping and murder in Kyzyl. The child's mother handed in an application about his disappearance on August, 12. As investigators established, the 15-year-old teenager was pushed into a car and taken in the unknown direction from the yard of his house. In two days the teenager's body was found by passers-by.